The DSE7560 is an Automatic Transfer Switch and Mains Control Module, designed to automatically synchronise multiple DSE7510s with single or multiple mains (utility) supplies. 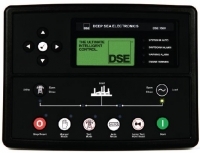 The module instructs the DSE7510s to make precise changes to the generating set outputs. This makes the module suitable for many applications including peak lopping, peak shaving and no break return. The module has the ability to monitor the mains (utility) supply and start and stop the generating sets (being controlled by a DSE7510) upon removal or detection of the mains (utility) supply. The modules operational status is indicated on the LCD display and the front panel LEDs.